In inorganic chemistry, a nitrite is a salt of nitrous acid. The salt contains a nitrite ion consisting of one nitrogen and two oxygen atoms. 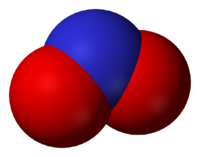 In organic chemistry, a nitrite is an ester of nitrous acid and an alcohol. Sodium nitrite is used as a food preservative and in reddening meats. Many nutritionists recommend the avoidance of foods that contain sodium nitrite because it can undergo chemical reactions that produce nitrosamines, which are known carcinogens. Sodium nitrite is also used in dyeing textiles, bleaching fibers, photography, metal coatings, and the manufacture of rubber chemicals. In medicine, it has been used as a vasodilator, bronchodilator, and intestinal relaxant or laxative. Both sodium nitrite and amyl nitrite may be used to treat heart disease and cyanide poisoning. This structural representation of the nitrite anion is called a "resonance hybrid." It shows that the N-O bonds in a nitrite ion have a bond order of about 1.5, with most of the single negative charge shared between the two terminal oxygen atoms. These two representations of the nitrite ion (NO2−) contribute to the resonance hybrid shown above. As noted above, inorganic nitrites are salts of nitrous acid (HNO2). They contain the nitrite ion (NO2−), which has a bent structure, with the same electronic distribution as ozone (O3). Nitrites of the alkali and alkaline earth metals can be synthesized by reacting a mixture of nitrogen monoxide (NO) and nitrogen dioxide (NO2) with the corresponding metal hydroxide solution, or by the thermal decomposition of the corresponding nitrate. Other nitrites are available through reduction of the corresponding nitrates. Nitrite is detected and analyzed by the "Griess reaction," involving the formation of a deep red azo dye. This dye is produced when a sample containing NO2− is treated with sulfanilic acid and naphthyl-1-amine in the presence of acid. Nitrite can be reduced to nitric oxide or ammonia by many species of bacteria. In organic chemistry, nitrites are esters of nitrous acid and alcohols. They have the general formula RONO, where R is an aryl or alkyl group, and ONO is called the nitrosooxy functional group. An example is amyl nitrite, mentioned below. Sodium nitrite (NaNO2) is a white to slight yellowish crystalline powder. It is very soluble in water and is slowly oxidized by oxygen in the air to sodium nitrate (NaNO3). It is used as a color fixative and preservative in meats and fish. This compound is used for the curing of meat because it prevents bacterial growth and, in a reaction with the myoglobin in red meat, gives the product a darker red color. This nitrite, however, poses at least two problems. First, it is toxic at relatively high concentrations—the lethal dose of nitrite for humans is about 22 milligrams per kilogram body weight. For this reason, the maximum allowed nitrite concentration in meat products is 200 parts per million (ppm). Second, under conditions such as cooking, nitrites in meat can react with the degradation products of amino acids to form nitrosamines, which are known carcinogens. For this reason, many nutritionists recommend the avoidance of red meats and other foods that contain sodium nitrite. Sodium nitrite is also used in manufacturing diazo dyes, nitroso compounds, and other organic compounds; in dyeing and printing textile fabrics and bleaching fibers; in photography; as a laboratory reagent and corrosion inhibitor; in metal coatings for phosphatizing and detinning; and in the manufacture of rubber chemicals. Sodium nitrite has also been used in human and veterinary medicine as a vasodilator, a bronchodilator, an intestinal relaxant or laxative, and an antidote for cyanide poisoning. Alkyl nitrites are chemical compounds with the general structure R-ONO. Formally, they are alkyl esters of nitrous acid. Methyl nitrite and ethyl nitrite are gases at room temperature and pressure, and the next few (larger) members of the series are volatile liquids. The compounds have a distinctive fruity odor. In the laboratory, solutions of alkyl nitrites in glacial acetic acid are sometimes used as mild nitrating agents. The product formed is acetyl nitrate. Amyl nitrite, also called pentyl nitrite, is an alkyl nitrite that contains five carbon atoms per molecule. Typically, the term refers to the chemical compound with the formula (CH3)2CHCH2CH2ONO. Like other volatile alkyl nitrites, it has a characteristically penetrating odor and produces marked effects on the human body when its vapor is inhaled. It acts as a vasodilator (expanding blood vessels and thus lowering blood pressure) and finds applications in medicine in the treatment of heart disease such as angina. Amyl nitrite is also used to treat cyanide poisoning by inducing the formation of methemoglobin, which sequesters cyanide as nontoxic cyanomethemoglobin. Nitrates: They are either salts of nitric acid or esters of nitric acid and various alcohols. Nitro compounds: They are organic compounds that share the formula RNO2, where R is an aryl or alkyl group, and NO2 is called the nitro functional group. Nitronium cation: It has the formula NO2+. ↑ Ivanov, V. M. "The 125th Anniversary of the Griess Reagent." Journal of Analytical Chemistry 59:10 (2004): 1002–1005. Trans. from Zhurnal Analiticheskoi Khimii 59:10 (2004): 1109–1112. ↑ Adams, Mike. 2005. “The real reason why processed meats are so dangerous to your health.” NewsTarget.com. Retrieved March 23, 2007. ↑ “Feature articles on sodium nitrite.” NewsTarget.com. Retrieved March 23, 2007. ↑ Vale, J. A. "Cyanide Antidotes: from Amyl Nitrite to Hydroxocobalamin - Which Antidote is Best?" Toxicology 168:1 (2001): 37-38. This page was last modified on 15 January 2015, at 17:17.